Three exciting things to note. 1) ETSY SALE! 20% off all ready-made cushions, tote bags and stickers in my Etsy shop. Use the code: SALEFORNOREASON – Valid until Sunday 28th April. 2) I hit 500 instagram followers!!! THANK YOU ALL SO MUCH! 3) I’ll be taking custom cushion and bag orders until May 16th – 1 month later I’ll be heading off on a giant long-awaited trip to South America! If you’ve been thinking about ordering a custom cushion, have a look at my Etsy shop or instrgram account for some inspiration! You can use the custom order form. These facts may or may not be connected. 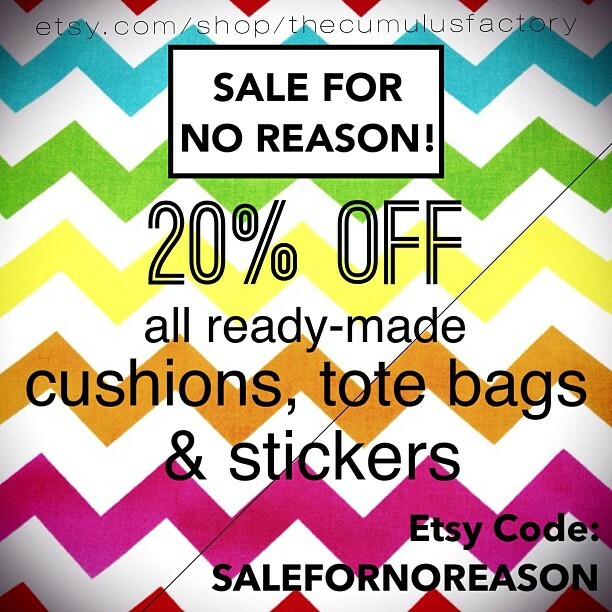 This entry was posted in Etsy and tagged cushion, custom, etsy, instagram, sale, shop, tote bag on April 22, 2013 by thecumulusfactory.